Architecture — An SMBus battery contains permanent and temporary data. The permanent data is programmed into the battery at the time of manufacturing and include battery ID number, battery type, serial number, manufacturer’s name and date of manufacture. The temporary data is acquired during use and consists of cycle count, user pattern and maintenance requirements. Some of the temporary data is being replaced and renewed during the life of the battery. The SMBus is divided into Level 1, 2 and 3. Level 1 has been eliminated because it does not provide chemistry independent charging. Level 2 is designed for in-circuit charging. A laptop that charges its battery within the unit is a typical example of Level 2. Another application of Level 2 is a battery that contains the charging circuit within the pack. Level 3 is reserved for full-featured external chargers. Most external SMBus chargers are based on Level 3. Unfortunately, this level is complex and the chargers are costly to manufacture. Some lower cost chargers have emerged that accommodate SMBus batteries but are not fully SBS compliant. Manufacturers of SMBus batteries do not readily endorse this shortcut. Safety is always a concern, but customers buy these economy chargers because of the lower price. Figure 7-2: Two-wire SMBus system. The SMBus is based on a two-wire system using a standardized communications protocol. This system lends itself to standardized state-of-charge and state-of-health measurements. Serious industrial battery users operating biomedical instruments, data collection devices and survey equipment use Level 3 chargers with full-fledged charge protocol. No shortcuts are applied. To assure compatibility, the charger and battery are matched and only approved packs are used. The need to test and approve the marriage between specific battery and charger types is unfortunate given that the ‘smart’ battery is intended to be universal. Among the most popular SMBus batteries for portable computers are the 35 and 202 form-factors. Manufactured by Sony, Hitachi, GP Batteries, Moltech (formerly Energizer), Moli Energy and many others, this battery works (should work) in all portable equipment designed for this system. 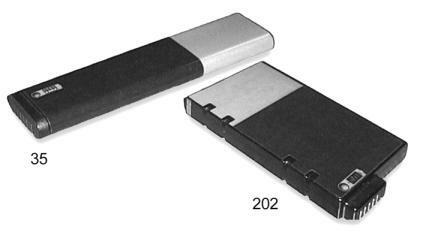 Figure 7-3 illustrates the 35 and 202 series ‘smart' batteries. Although the ‘35’ has a smaller footprint compared to the ‘202’, most chargers are designed to accommodate all sizes, provided the common five-prong knife connector is used. Figure 7-3: 35 and 202 series ‘smart’ batteries featuring SMBus. Available in NiCd, NiMH and Li-ion chemistries, these batteries are used for mobile computing, biomedical instruments and high-end survey equipment. The same form factor also accommodates NiCd and NiMH chemistries but without SMBus (‘dumb’).